Snap-ring pliers are engineered to both remove as well as to install snap rings. You may not use them a lot, but when you need one, they're really the only tool to get the job done. They work on snap (or retaining) rings, which are fasteners that hold assembles or components onto a shaft or in a housing when it is installed within a machined groove (Wikipedia). Retaining ring pliers are specialty tools that have a highly specific function. Mechanics, service professionals, electricians and even some home repair do-it-yourself types say that without this specific tool it is nearly impossible to either install or remove a snap ring (Home Depot). Unfortunately, most of these specialty tools are junk that don't survive (poorly) executing one retaining ring installation or removal. The one exception is the USA-Made Channellock pliers, which is why it's our top pick. Is it built for internal and external ring installation/removal? Will it survive more than one use? 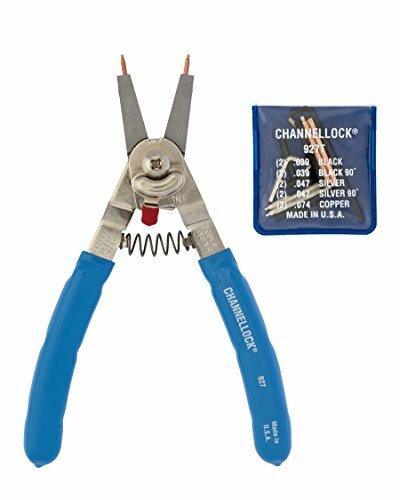 These Channellock pliers are American-made and are designed for internal and external snap ring installation or removal. They're the most durable and easily-used snap ring pliers of the options we examined. Not cheap, Chinese-made junk, but not the most expensive option either- a solid middle ground. You can easily switch from from external to external rings with a toggle of the tabbed switch. It ships with five pairs of color-coded interchangeable tips. Internal use: 3/8" to 2"
Let's take a look at 5 of the best-selling options on the market and see how they compare. These 6-½ inch snap ring pliers offered by Irwin are comfortable, easy to use, and practical for any homeowner. Users love that the pliers are suitable for internal and external use, but so do note that the rivet is not tight enough. These lock ring pliers measure 11” x 5.1” x 1.1”, and they have ProTouch grips for added comfort, a durable alloy steel construction, and a weight of 7.7 ounces. They feature four interchangeable tips, and they come with a lifetime guarantee. Overall, these pliers are an excellent choice if you want a 2-in-1 set of pliers. A user comments that the Irwin snap ring pliers are perfect for changing C-clips and that he is very impressed with the quality. The reviewer adds that it takes seconds to change the tips and they stay in place. But the user would have preferred if there was a storage case for the extra tips. Another happy user mentions that these pliers feel sturdy and that it’s easy to set them up for external or internal snap rings. He highly recommends them as one of the best snap ring pliers. However, some customers have complained that these convertible snap pliers are flimsy and that the interchangeable tips fall off. Some also note that the tips are short and that they found the pliers hard to use. If you’re looking for top-notched snap ring pliers, you might want to take a look at these ring pliers offered by Channellock. Users love the heavy-duty design, but some do note that they are expensive. These retaining pliers measure 12” x 5” x 1.2”, and they are made of polished steel. The pliers feature heavy-duty return spring, a switch for changing from internal to external rings, a weight of 8 ounces, and five pairs of color-coded interchangeable tips. The internal range is 3/8 inches to 2 inches, while the external range is ¼ inches to 2 inches. The pliers also have a lifetime guarantee. In general, users have a very high opinion regarding the Channellock retaining pliers, and they praise their functionality and design. A buyer comments that these are the best pair of snap ring pliers that he has owned and that they open wide enough to remove 2” C-clips. The reviewer adds that the reversing mechanism is useful and easy to engage. A happy purchaser shares that the interchangeable tips come with a convenient pouch for storage and that the pliers are perfect for repairing a dryer’s blower. However, some customers have complained that the pliers broke quickly and that they don’t grip strongly. A user also notes that the switching mechanism doesn’t work as it should and that the small tips break. These lock ring pliers offered by Tekton are cheap, handy and comfortable to use. Users love the price and the plastic storage case, but some do note that they are not durable. These universal snap pliers measure 4 x 1.2 x 7.8 inches, and they are made of heat-treated carbon steel. They feature a corrosion-resistant black finish, precision-machined interchangeable tips for external and internal use, spring-loaded handles, non-slip grips, and a weight of 8.8 ounces. The external range is 1″ – 2 ½”, while the internal range is 3/4″ – 1 ¾”. In general, users have a mixed opinion regarding the Tekton snap ring pliers, and they agree that the pliers are flimsy. A buyer comments that the tips bend and that it’s difficult to pull snap rings. The reviewer also mentions that the ring pliers fall apart during use and that he doesn’t recommend them for regular or repeated usage. Another unhappy user warns that these universal lock ring pliers shouldn’t be used with heavy snap rings and that he is disappointed by their performance and quality. On the other hand, a happy customer states that the pliers arrived quickly and that he didn’t have any problems removing or reinstalling a snap ring. A purchaser says that he doesn’t worry that the snap pliers would break and that they are reliable when you use them correctly. These lock ring pliers offered by ABN are inexpensive, practical, and light. Users love the price and the comfortable handles, but some do note that it’s not easy to change the tips. These pliers measure 0.5” x 0.4” x 7”, and they feature four interchangeable jaws, vinyl handles for firm grip, and a comfortable gripping area that decreases hand fatigue. The tips that come with pliers include two straight tips, one 45-degree angle tip, and one 90-degree angle tip. As a whole, these pliers are good if you want cheap pliers, but they have several shortcomings. In general, buyers have a favorable opinion of the ABN snap ring pliers set. A user comments that once you get used to these lock ring pliers, they work perfectly. The reviewer adds that the pliers arrived quickly and that they are well-made. Another customer shares that he bought them to fix the front driveshaft of his Grand Cherokee and that they did the job smoothly. He mentions that they would probably last for a long time. A purchaser also states that it’s easy to change the tips. However, some customers have complained that the pliers are cheaply made and that they fall apart while you’re using them. Some users also note that the tips don’t fit tightly and that the design has numerous flaws. A buyer also adds that it’s not suitable for heavy-duty rings like CV joints. These convertible snap ring pliers offered by Ares are expensive, reliable and handy to have around your home. Users love that the pliers are easy to use, but some do note that they aren’t suitable for heavy-duty work. These ring pliers measure 1.2” x 5.4” x 8”, and they feature precisely machined and tapered tips, a hex key and a weight of 8.8 ounces. The internal size range is 7/8″ – 1-7/8″, while the external range is 5/16″ – 1-7/8″. There are eight interchangeable tips included – four straight and four 90-degree angled tips. A buyer comments that the Ares snap ring pliers are strong, stable and well-constructed. The reviewer adds you only need to flip a switch to change from inside to outside rings and that he is very impressed with their functionality. Another customer shares that these lock ring pliers are a necessity for every repairman and that it’s incredibly easy to use them. He also states that you should tighten the locking mechanism correctly before using them. Another satisfied purchaser adds that the used these snap pliers to rebuild a motorcycle cylinder and that he didn’t encounter any issues with them. However, some customers have complained that the Ares convertible lock ring pliers are not meant for rusty rings and that the tips bend quickly. A user also notes that the handle is widely open and that it’s uncomfortable for small hands. 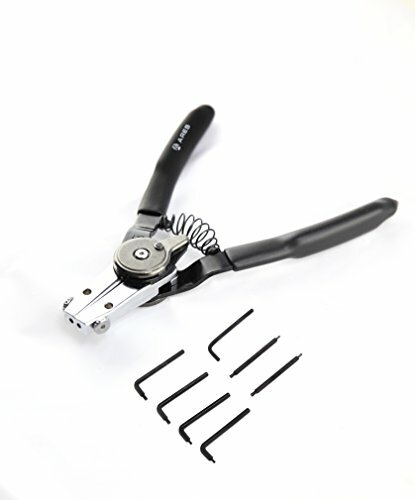 In appearance, they resemble an ordinary set of pliers- there are two arms that are connected to a pivot, but the tip of the arms are bent at a 90° angle with ends that are shaped so that they fit into the intricate, round holes of the snap ring you are attempting to install or remove. Oftentimes, you can find snap ring pliers that have spring mechanisms that help retract recalcitrant snap rings from rotors. Their heads, most of the time, are reversible so that you can both push and pull to position the snap ring into or out of its rotor groove. Snap rings themselves look like metal circle rings that have a separation at one point of their circle. At this opening the snap ring has a pair of small circle bores that the plier will grab onto, squeezing and then turning them outward or inward. The first pair of convertible snap ring pliers we examined was the 6 1/2 inch Irwin Tools pair. Irwin Tools says that they are designed for both internal and external use, meaning you don't need to purchase two separate sets- just buy one for dual use. It ships with four different interchangeable tips so you can handle multiple types of projects. They are reversible and their 'easy-to-change' tips work for internal and external use. One c clip tool buyer we spoke with a side of that they are not that well-made-really, they are typical, low-quality, Chinese made goods. Other buyers concurred, saying that the quality is inferior and that the snap ring pliers constantly slipped out of place, preventing users from getting a solid grip on Smalley snap rings. Many reviewers we interviewed told us that they ultimately purchased a pair of American-made Channellock snap ring pliers to replace these faulty and poorly constructed pliers. Further, other buyers we spoke with told us that they are flimsy, with the tips broadly splayed which made it near impossible to maintain a grip on the ring when squeezing within rotors. They ended up shopping at their local Home Depot and Harbor Freight to get a sturdier c clip tool. A washing machine repairman also told us how difficult it was using these pliers to work on a household installation, saying that the pliers' rivet is not tightened enough and that whenever you try to grasp a snap ring its ends are consequently misaligned, causing the ring to slip loose. The second pair of retaining ring pliers we examined was the Channellock 8 inch pair- this USA-made option ships with five pairs of interchangeable tips designed to work with both external and internal rings. One buyer we spoke with impressed on novice users the need to use these tools intelligently in a delicate way to start. They say that if you force it with too much brute strength, or if the retaining ring is really stuck, the retaining ring plier will not be any help and it's likely you'll have to resort to using an oil and heat method to loosen up the stuck snap ring. Another repairman concurred, saying that they purchased these to work on C-clips, saying that he endorses them because of how wide they open, spacious enough for a 2 inch grip. Another reviewer we interviewed and told us that for the price, they are hard to beat- saying that they are easily interchangeable for internal and external use. 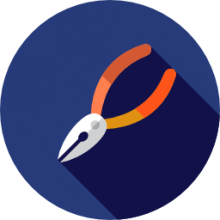 Other buyers also echo the earlier reviewer's advice to work gently with this tool, saying that it's likely that buyers who broke it forced the lever. A handyman we spoke with who works with kitchen equipment found that be variety of interchangeable tips suited the diverse range of equipment he found himself operating on- particularly the .036 tips. The third option we examined was the Tekton universal retaining ring pliers set- the manufacturers say that they are precision instruments designed with non-slipping, ergonomic handles. It ships with a pair of straight tips, one 45° bent tip, and one 90° bent tip. 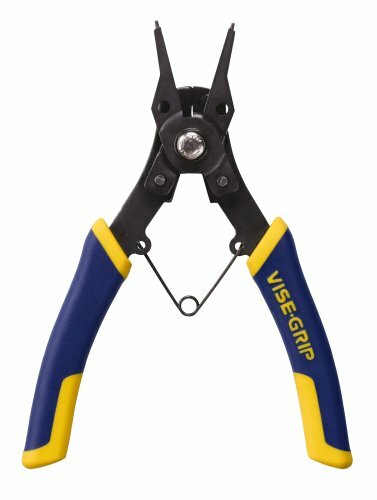 Visa snap ring pliers have received relatively poor reviews from the buyers we spoke with, whose overall impression is that they are cheaply made, flimsy and that they were poorly machined. Reviewers describe the tool causing the snaprings to fly across the room and disappearing. Another c clip tool reviewer we spoke with criticized the use of rivets, saying it would've made more sense to use screws or a style of butterfly mechanism. As well, the grip spring was criticized for lacking useful tension. Another buyer whose washer and dryer combo had broken described trying to use the snap ring pliers to work on the blower fan and saying that he was pretty frustrated by the flimsy design, saying that if you are not exceedingly careful that the interchangeable heads are prone to falling off as you are performing the delicate removal of a snap ring. The fourth snap ring pliers that we examined was manufactured by ABN. 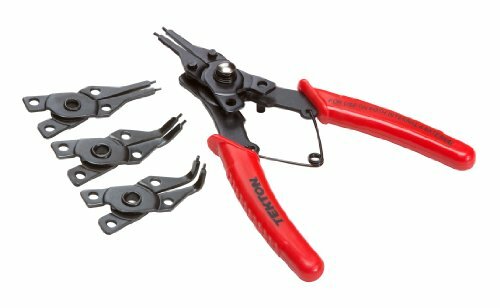 This snap ring plier set is designed for the removal and installation of both external and internal snap-rings, and ships with 4 interchangeable jaws. Again, we have seen a variety of mixed reviews for this particular pair of pliers, with the general consensus being that they are poorly made and frustrating to use. One buyer told us that the primary difficulty is with the interchangeable heads, which have a tendency to fall apart as you are using them (on push nuts & retaining clips, for example) on account of their poorly designed spring loaded clip. While some buyers didn't say they were able to eventually get them to work, if you aren't looking for a one-time use, it might be a better idea to look at the large Channellock pair for a durable and more cost-effective option. Another reviewer echoed the common sentiment expressed by the majority of buyers, saying that from his perspective the replaceable ends are so poorly manufactured that you aren't able to transfer any pressure to the snap ring you are either installing or removing. The last option and we took a look at was the Ares large retaining ring pliers. The manufacturers say that they have designed their pivot point with a mechanical ratchet system design to apply effective pressure to the snap ring while maintaining appropriate orientation. You're able to reverse the action by toggling from external to internal- and they ensure buyers that the tapered tips are engineered so that the pliers don't frustratingly slip out of the ring as you are manipulating them. Buyers we spoke with were more impressed with this option than many of the others, excepting the Channellock pliers. 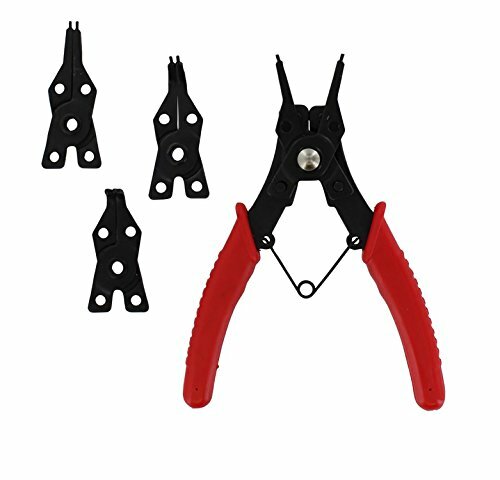 Repairman say they were able to use these tools variety variety of applications, though some buyers said they are not adequate for heavy-duty use, which is expected at the relatively low price point these pliers come in at.